Eating healthy can be easy when you plan and experiment with new items! In fact it is FUN! This past week I wanted something that was tasty and easy to make and would be great for snacking and lunch. I wanted to put my own twist on a classic veggie pizza using Pillsbury crescent rolls. Once the dough had cooled I added the cheese mixture then topped with the cut up veggies! Dawn will gladly answer any questions you might have concerning their products. You can also order online and have all items shipped directly to your home. I've never thought of putting DILL on my pizza, but now that you've said it, I'm wondering why not? Great idea! Yum! Dill is one of my favorites but I always forget about it. I'll have to try this! This sounds so light and refreshing! I love dill too! Never would have thought to put dill on a pizza. Looks delish! ummmmm I'd eat that alone - it looks and sounds great. I haven't cooked with Dill before but want to. I love Dill and dill in dips. This seems like it would be delicious and easy to make. I absolutely love Dill, so this has to be great. It's so colorful! This looks really GREAT. I grow my own dill, so I am trying this out. I am so liking this. I will have to try it. I have never even thought about putting dill on my pizza...interesting concept. I'm not sure if I would like it, but sounds like something right up my hubby's ally. YUMMO! It looks super yummy. 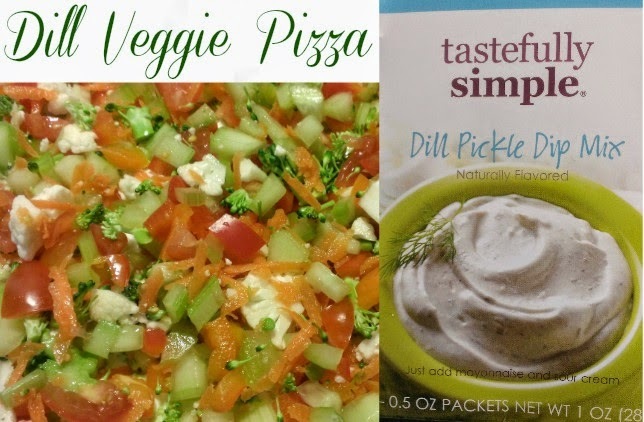 I love veggie pizza and the dill would be a unique twist on the flavor! My husband and I would devour that! We love pizzas like this with veggies on it! This is such a creative recipe. You have so many great fresh vegetables in this recipe, it sounds wonderful. This recipe looks so good and easy to make. I wonder if my family would enjoy the dill taste though...??? Dill on a pizza...never thought of it! we are growing Dill and I may give this a try. I love making fresh pizzas at home, but this one is new to me. What a fab recipe! This looks delicious! I love finding different kinds of pizza recipes to try out! That looks delicious and perfect for summertime! I have only tried a few Tastefully Simple products but they have all been yummy! This sound delicious! My daughter is very picky about her toppings-but this might be worth a try! This sounds so good! I always like to try new kinds of pizza! We enjoy pizza but haven't tried making a veggie pizza before. This will be a good recipe to try. My Hubs puts dill on everything these days, especially his salad. This looks like a yummy veggie pizza! We love dill dip here. This sounds like a great fresh pizza!